I used to work from home when our church started. As I prepared my sermons, I would look out the window and be motivated by the beautiful bougainvillea flowers in our garden. One day I looked out and saw the gardener chopping up my beloved bougainvillea bushes. Branches flew everywhere until all the leaves and most of the branches were in a pile. My first thought was that we had hired the worst gardener in history. I quickly found my wife, Gloria: “Have you seen what the gardener is doing? He is destroying everything!” It upset me that all the beautiful branches and flowers lay wilting on the ground. Obviously, I never took Gardening 101. To my ignorant eye, this butcher of the bushes was killing my flowers; but to the knowing eye, he was a wise vinedresser. He knew that a bush’s life actually increases with pruning. Before Jesus went to the cross, he gave a final sermon to his disciples. Right in the middle, he uses a gardening metaphor to describe the importance of growing spiritually and drawing strength from him—the true vine. He also says, “Every branch in me that does not bear fruit he takes away, and every branch that does bear fruit he prunes, that it may bear more fruit” (John 15:2). Jesus was telling the disciples and all Christians that he was setting them apart for a lifestyle of bearing fruit. Their fruit would come as a result of God’s intentional pruning. A wise vinedresser doesn’t let his fruit grow wildly on its own. In order to produce the best fruit, he must follow the established rules of pruning by cutting away dead or overgrown branches to encourage growth. Before the grapes can be made into wine, pruning must occur. Like the branches in Jesus’s story, we’re all unique, and our pruning won’t look the same. He will prune us differently, but this is a process we entrust to him, knowing that he is good and at work in our lives. Pruning often happens during our trials because suffering is a prime time for the revelation of the idols in our hearts. We can’t really grow spiritually and turn away from our idolatry if we can’t identify our own idols. I love the illustration biblical counselor David Powlison uses to show how our difficult circumstances serve as effective idol-revealers. He takes out a water bottle filled with water, removes the cap, and starts smashing the bottle, bending it, and spilling water out of it. Soon water is all over the place. Powlison then asks, “Why is there water on the floor?” The initial answer is that there is water on the floor because he shook the bottle. But the ultimate answer is that there is water on the floor because there was water in the bottle. The situation doesn’t create the water. Our biggest problem isn’t outside of us, but inside our own hearts. In the same way, your circumstances don’t create what’s in your heart; your situation is simply the stage on which the heart’s condition is revealed. For more than 12 years now I’ve struggled with disability and chronic pain in both of my arms. The pain has led to one surgery after another. I’m still disabled and unable to get dressed on my own. I can’t drive, much less buckle my own seatbelt or open the car door. The pain is incredibly high on some nights, and I’m unable to fall asleep. Many of my idols have been revealed to me during this ongoing trial. Until I began to suffer with this nerve disease, I didn’t know that I was an impatient person who had control issues. For the longest time, I blamed my anger on my pain, and I blamed my impatience on my wife. My idol of comfort was elevated over everything in my life, and it was destroying me. Ironic, isn’t it? Idols are harsh masters. But God was graciously pruning me by exposing my sin. My circumstances didn’t cause my sin, but merely brought out into the open what was already in my heart. What I had (and still have) was an opportunity to repent and grow. It’s often been said that people don’t drift toward holiness. Growing in holiness doesn’t happen automatically. Our trials are times to trust God to use our pain to make us more like Christ. Our trials are times to trust God to use our pain to make us more like Christ. With this perspective we can say that trials are a gift. James even calls them a joy! We can fight for joy in our trials because God is working on our hearts, pruning us more into the image of Christ. It may feel like you’re being chopped up, but the divine gardener is pruning you so that you bear more fruit in your life than you could ever ask for or imagine. This article is published in partnership with Crossway. 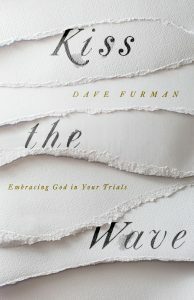 Dave Furman’s new book, Kiss the Wave: Embracing God in Your Trials, is now available.